Blue was the original color of St. Patrick's Day. 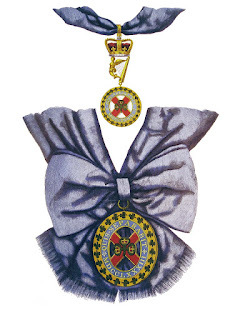 The color known as St. Patrick's Blue describes a sky blue associated with the Order of St. Patrick.as depicted in the badges from Sir Nicholas Harris' (1799-1848) History of the Orders of Knighthood of the British Empire, of the order of the Guelphs of Hanover; and of the medals, clasps, and crosses, conferred for naval and military service. 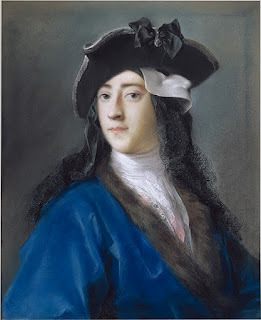 Irish peer Gustavus Hamilton, 2nd Viscount Boyne (1710-1746) is wearing a cobalt blue Masquerade costume in the pastel portrait by Venetian Rococo painter Rosalba Carriera. Flemish artist Lucas de Heere (1534-1584) captures a sixteenth century Irish woman dressed in a pale blue frock. "The Wearing of the Green" came from St. Patrick using the shamrock as a metaphor for the Christian Trinity when converting the pagan Celts. Green shamrocks latter became a symbol of the fight for Irish freedom.